Why do I have bats in my house? Bats in areas such as the Pelahatchie Bay, North Shore, Sand Hill, The Mound at Lost Rabbit, Fannin Landing, Point Clear, Brandon, Jackson, Madison and Ridgeland MS spend over half of their lives roosting so where and why bats roost make it important to understand our many diverse bat species we have here in North America. Do you blame them for just Loving the Ross Barnett Reservoir area? Lake Hamilton has plenty of water, mosquitoes and homes for shelter! Bats are regularly found in trees, caves, under bridges, vacant buildings and found roosting in an around the attics of homes to name just a few places. Bats require a safe roosting place away from predators and severe weather including extreme high and low temperatures. The bat roost always becomes a communication place between bats and where a bat colony would live together to raise their young bat pups, rest and digest their food and hibernate together. Does bat exclusion get all the bats out of my attic and where do they go? Bats have both day and night roosting places. The day roosting place is for extended rest periods and the night roosting places are used for brief resting while eating. Over the course of a night, bats may rest more than once at different roosting locations. Some bat species use their night roosts to hunt for prey and in tropical regions bats species may use them to call potential mates. 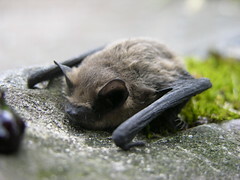 Bats may change roosts daily when threatened by predators or have different summer roost such as homes or attics and winter roosting locations such as caves. Bat roosts are chosen because of favorable protection against wind, temperature and moisture amounts in the roosting area. If you ever had a question about a bat’s ability to bite and if it might hurt…just a little! Bat bites are so small you might not even know if you’ve been bitten by a bat! Only about 2.8% of all bats are rabid or carry rabies so you are probably OK. To be on the safe side, have the bat tested or seek treatment for a bat bite. Rabies is Fatal to humans! Why do bats live in my house? I answer is really, why not? Your home is excellent habitat for a bat as well as other types of wildlife but it can be prevented! Read an interview about urban wildlife I gave HERE. Who is a professional bat removal company in Jackson MS? We remove bats and provide bat exclusion services to the following areas in Mississippi: Vicksburg MS, Beechwood Mississippi, Bovina MS, Edwards MS, Bolton MS, Raymond MS, Clinton MS, Jackson MS, Ridgeland MS (My home town), Madison MS, Brandon MS, Richland MS, Flowood MS, Pearl MS, Byram MS, Florance MS, Whitfield MS, Fondren MS and areas around the Ross Barnett Reservoir such as Sand Hill, The Mound at Lost Rabbit (oh, the stories I could tell!) Point Clear, Pelahatchie Bat, North Shore, Fannin Landing and Northshore. Do you have Bats in the Walls, Bats in the House or Bats in the Attic? We Get The Bats Out, Seal The House Up and Clean up Bat Guano!